How have people benefited from books and libraries? By gaining access to information, culture, and education. Libraries without Borders supports the same values of personal and community development in a modern way with their "Ideas Box." The "Ideas Box" is a portable multimedia library that ships easily to vulnerable populations around the world. From the U.S. to Burundi, France, Australia, Jordan and Lebanon, these kits have reinforced education and stimulated creativity in needed areas. By supporting Libraries without Borders, you'll help provide a critical resource that can empower communities who need it most. Hi, my name is Allister Chang. 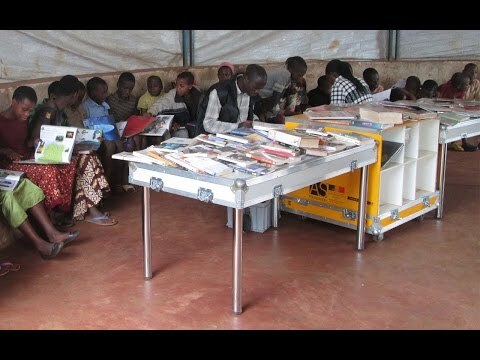 I'm the Executive Director of Libraries Without Borders, an international non-profit that works to expand access to information by creating and supporting library spaces in over 20 countries. I am excited to share the story of our most recent innovation, the Ideas Box, with The Grommet community! It is easy to take something as simple as a library for granted when we have so many other ways to access information. I know I do! This is a great reminder that libraries are more than just sets of books and computers. 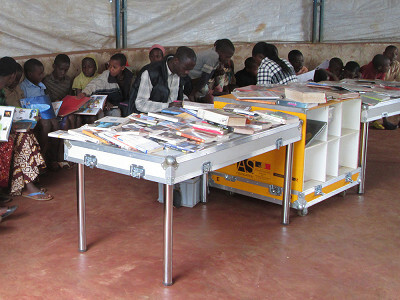 Why was it important for Libraries without Borders to develop the Ideas Box? Displaced communities and refugees have immediate needs for food, clothing, shelter, and medical aid. Once these needs have been met, communities seek to rebuild. Too often, the tools to build the future are lacking. The Ideas Box was born from this challenge to provide access to information, culture, and education for refugees. We created the Ideas Box along with the UNHCR and designer Philippe Starck specifically so that it could be set up in the harshest and most isolated contexts. The shell protects the contents from severe environment and/or inclement weather. It is autonomous and fits on two standard transportation pallets. The easy-to-transport kit opens to serve over 70 users. How have communities reacted to the Ideas Box? The first two Ideas Boxes, deployed in the Kavumu and Musasa refugee camps in Burundi, had more than 24,000 visits in just 3 months with more than 3,000 registered users. 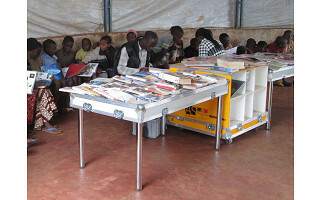 Through focus groups at Ideas Box spaces in refugee camps, users frequently commend the Ideas Box for creating a “safe space.” As designer Philippe Starck described about his design for the Ideas Box, there is a difference between keeping a community alive and providing the basic tools for a community to really live. How is Libraries without Borders' approach different from similar organizations and how do you measure a project's success? LWB focuses on expanding access to information. We believe that access to information provides the foundation for sustainable disaster relief and economic development. We measure a project’s success through psycho-social healing, community resilience, and economic development. What is the most rewarding part of being involved with the Ideas Box project? One of the most rewarding parts of working with the Ideas Box is seeing how it creates a space that brings together cross-sector partnerships. Everyone is a potential collaborator, and everyone has something to contribute to the project. Different experiences, perspectives, and insights help us ensure that we are maximizing the efficiency and efficacy of our resources. How have people benefited from books and libraries? By gaining access to information, culture, and education. Libraries without Borders supports the same values of personal and community development in a modern way with their "Ideas Box." The "Ideas Box" is a portable multimedia library that ships easily to vulnerable populations around the world. From the U.S. to Burundi, France, Australia, Jordan and Lebanon, these kits have reinforced education and stimulated creativity in needed areas.